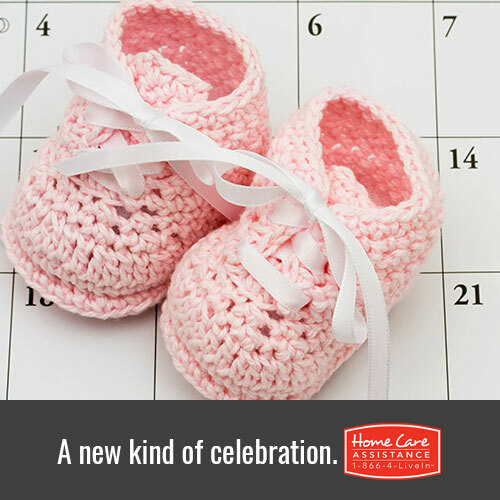 As a leading provider of senior care in Harrisburg, we’ve noticed a growing trend of Grandma-to-Be parties, which let grandmas everywhere celebrate the birth of their new grandbaby. Becoming a grandparent is one of the biggest events in a senior’s life, and being the recipient of a “Grandma shower” is an extension of the good news. Throwing a shower for your senior loved one is a great way for family members and friends to share the joy that a baby brings. Throwing the grandmother a party is a unique idea that has taken off in many areas of the country. Most senior women are excited to embrace this new, fun stage in their life and a party with friends and family is the perfect way to do so. In a time when more and more new parents are going back to work after having a baby, grandparents are taking on larger roles in the baby’s life. Most moms and grandmas-to-be will attest to the convenience of simply having a second set of everything to leave at the grandparents’ house. However, baby stuff doesn’t come cheap and throwing grandma a shower is a fun way to get many must-have supplies. If your senior loved one is becoming a grandparent, consider throwing her a shower (it’s also becoming common for both grandparents to partake in the party). You can reach out to her hourly Harrisburg caregiver for help with planning, running errands, or decorating if you live a little far to make multiple trips. The party should be fun and based around the interests of the grandma, with a baby theme added in. You can find old photos of your elderly relative as a youngster, have a box where other grandparents can offer cards of advice, or create fun grandma or baby-themed crafts, like decorating bibs or picture frames. Before hosting a grandma-to-be shower, be sure to check with the mom-to-be and make sure she doesn’t feel as though the attention is being diverted from her. For tips on planning a party for a senior loved one or to learn more about senior emotional health and wellbeing, reach out to Home Care Assistance of Harrisburg. We are a leading provider of hourly and live-in care, including specialized dementia and Parkinson’s care in Harrisburg. Our experienced Care Managers can answer questions and schedule a free in-home consultation where you can learn more about the services available in your area. Call (717) 540-4663 today! We look forward to hearing from you!